Whether you’re an accomplished home cook with a family, or you’ve just moved into your very own first home, you’ll need to be able to cook meals for yourself and for your loved ones and friends. In order to make the best of your cooking abilities and to ensure that your culinary adventures are good fun too, you’ll need the best cookware that meets all your needs. However, the range of cookware sets on the market is vast, and finding the best cookware set for your individual requirements is no mean feat! In order to save you time and effort (that could be better spent creating great menus and meals! ), we’ve put together this guide for you. We’ll walk you through the whole process of choosing the best pots and pans set and answer some commonly asked questions. Not only that, we’ve also put together our Top 10 best pots and pans for the money, together with pots and pans reviews left by other purchasers to help you make your choice. 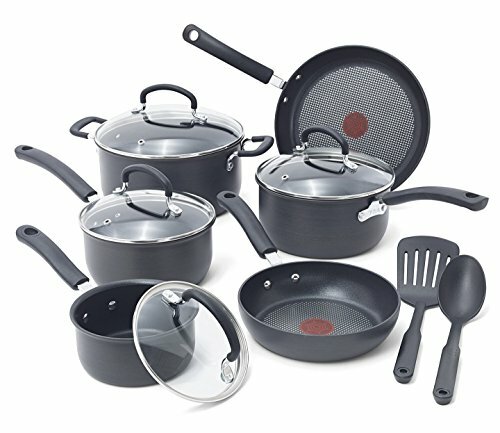 All these cookware sets are available to buy through Amazon.com. Simply click the handy link we’ve provided to view the complete product specification and read what other buyers thought of their purchase. When you’ve made your choice, simply place your order and look forward to the arrival of your new cookware set! Whether you cook every day or just on weekends or holidays, having the best pots and pans on hand can really make a difference to your kitchen experience and to that of your guests! Cookware sets come complete with a selection of pans, pots, and dishes that are all geared to suit different cooking styles and methods. The quality of the food you produce can be heavily influenced by the type of cookware you use. Different materials conduct heat in different ways, potentially impacting cooking time and the end result itself. Also, the kind of stove top you have can dictate the material you can choose for your cookware set. When deciding which would be the best pots and pans to buy, there are a number of things to consider. Material: The material that the cookware set is made of correlates directly to its ability to conduct heat. This will have a direct influence on cooking times and on the cookware’s suitability for preparing certain types of foods. For instance, aluminum and copper-bottomed pans conduct heat very well, whereas stainless steel is not quite so efficient. Uneven heat conduction means that the pans may have hot spots, and consequently your food will not cook evenly. Also, some foods react to contact with certain metals. Foods that are acidic can react with cookware that is made of aluminum, allowing the flavor of the metal to leech into the food. Durability: The longevity of your pots and pans is also something you should keep in mind when choosing the best cookware set. 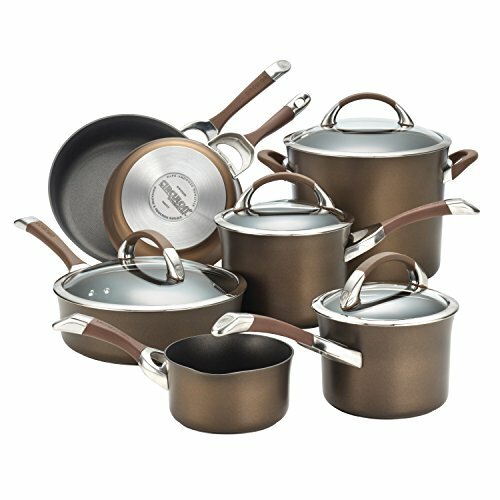 Quality impacts directly on how long a cookware set will last. Generally speaking, it’s best to buy the best quality, top rated cookware set that your budget will stretch to, just like when you are shopping for kitchen knives or electric knives. Buying cheap usually means that you will end up having to replace your pots and pans sooner, so it’s really just false economy. Maintenance: Different materials require different care. 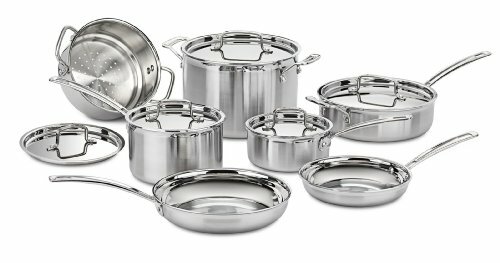 In general, stainless steel and aluminum cookware sets are quicker and easier to care for than those made from copper or cast iron. Also, cookware that has a non-stick interior coating will be quicker and easier to clean, as food should not stick to it. Cleaning your pots and pans should be as simple as wiping them over with kitchen roll, and then placing them in the dishwasher. Always check the maker’s instructions that come with the cookware set to make sure that you can safely put the pots and pans in a dishwasher. Not every cookware set is dishwasher safe, which means that you’ll have to spend more time washing each item by hand. If you live by yourself or as a couple, this may not be a problem for you. However, if you have a large family or tend to do a lot of entertaining, a cookware set that you can’t put in the dishwasher could be a non-starter for you. Purpose: A very important consideration when choosing the best cookware set is what you are intending to use the pots and pans for. Can you manage fine with a set of basic cookware, or does your culinary art demand an extensive choice of different pots and pans? For example, if you have a large family or if you regularly throw big dinner parties, you’ll need to choose a cookware set that has a good range of pots and pans of different sizes. However, if you live alone, a smaller set will probably suffice. At the end of the day, spending a fortune on a vast range of pots and pans is a waste of money if you will only ever use two or three of them. The market is awash with cookware sets, so how do you choose the right one? 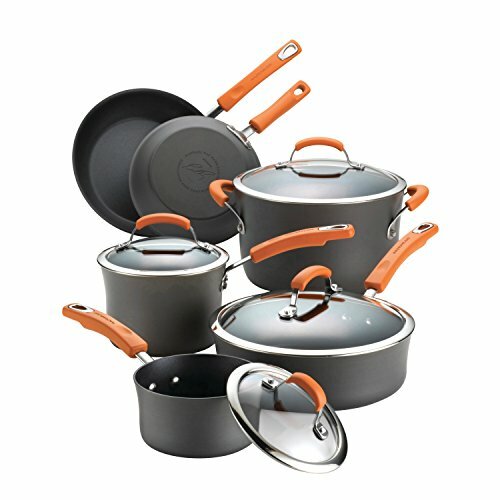 To help you make the right decision, we’ve put together a comprehensive list and guide to what we think are the best cookware sets currently available through Amazon.com, each one with different features and qualities. The set is available in 12, 14, and 17 pieces and comes with a lifetime limited warranty. The pots and pans are made from hard anodized material that’s safe to put in your dishwasher for quick and easy cleaning. They can be used with any stove type except induction. T-fal’s unique thermos-spot indicator technology indicates clearly when the pan is perfectly pre-heated, so you can easily see when it’s ready for cooking. A correctly pre-heated pan allows you to sear meat on immediate contact with the cooking surface, sealing in moisture and flavor for perfect results. TechnoResist Anti-Warp bases mean that your pans won’t warp, ensuring even heat distribution for the very best cooking results every time. The interiors are coated with Prometal Pro nonstick, which won’t scratch, even when used with metal utensils. Your food simply slides easily out of the pan without sticking – say goodbye to stuck-on, burnt food! The life of the coating can be extended by using a small quantity of oil when grilling or stir-frying. The cookware utensils are fitted with heat-resistant riveted silicone handles, which are oven-safe at temperatures up to 3500F. The handles are also ergonomically designed for comfortable gripping. Tempered glass lids allow you to view the food as it cooks and they all have small vents, so that heat and heat and moisture is retained inside the pan without the risk of boiling-over. The pots and pans in this cookware set are made from super-hard anodized aluminum, assuring you of quick and even heating and no annoying hot spots. The material is nonporous, dense, and extremely durable for longer life and superior, professional performance. There are handy measurement indicators in all the pans, except the skillets, so you can measure out your ingredients as you cook. The cookware set is oven-safe up to 5000F. The tempered, break-resistant glass lids will withstand oven temperatures of up to 3500F, and are fully transparent so you can watch your food as it cooks. A tight seal means that your food will retain moisture and nutrients as it cooks, making for juicier, more flavorful results. The premium nonstick coating of each item is reinforced with titanium so your food won’t stick or burn. There’s no need to use fat or oil, making your cooking healthier, and cleaning up is a breeze! The handles are made from solid stainless steel, which won’t heat up while you’re cooking, so there’s no danger of burning your hands. Note that this cookware set is not dishwasher safe and cannot be used with induction stove tops. The cookware set is made from triple-ply, brushed stainless steel with a mirror-polished interior to stop your food from sticking, will not react with food, change flavors, or discolor. Cuisinart’s Heat Surround technology guarantee a quick response to temperature changes, giving you the perfect cooking surface for a wide variety of different foods. The cookware has an aluminum core, sandwiched between layers of high-grade stainless steel to ensure optimal heat retention and distribution. The cookware set is suitable for use on all stove top types including induction, and it’s also safe for oven use up to 5500F. For ease of cleaning and time saving, the pots and pans are dishwasher safe. Each piece of the set has riveted stainless steel handles that will remain cool when on the stove top, so you won’t burn your hands. Also, all the pots and pans have tapered rims for drip-free pouring. Ultra-tight fitting stainless steel covers work to seal in moisture and flavor for healthier, tastier food. The cookware set comes with a lifetime limited warranty. The pots and pans are made from hard-anodized material for durability and strength, and they are lined with non-stock coating so that your food won’t stick or burn. For extra-easy cleaning, all the pots and pans are dishwasher safe. The double-riveted handles are finished in a fun orange color and are rubberized for safe, secure grip. The cookware items, including the shatter-resistant, tempered glass lids, are oven-safe at temperatures up to 3500F. The lids are designed to form a snug seal to lock in flavor, moisture, and heat, so that your food will cook through without drying out and losing its healthy vitamin content. Note that this cookware set is not suitable for use on induction stove tops. 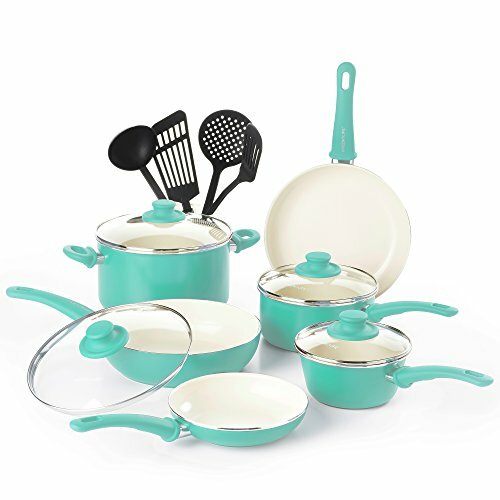 This stylish cookware set comes in a number of speckled color finishes, including red, coral, aqua, butter, blueberry, and lavender. The attractive outer of each item is stain-resistant, easy to clean, and durable. The cookware is made from heavy-gauge material for quick and even heating, and is lined with durable DuPont Teflon so that your food won’t stick or burn. 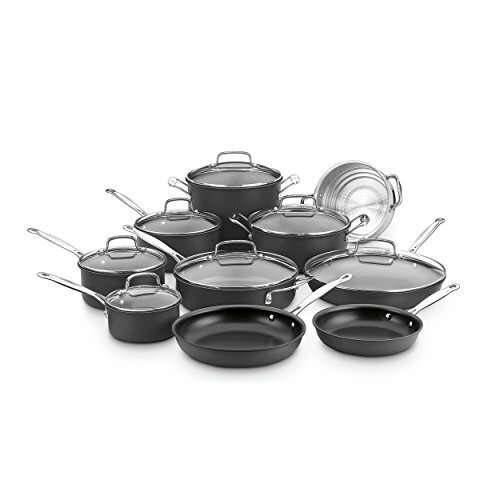 The non-stick surfaces are a breeze to clean, and the pots and pans are also dishwasher safe. The pots and pans are oven-safe up to 3500F. The handles are dual riveted for security and safety and are designed with a soft-touch finish for comfort. Copper-plated rings are incorporated into the design so that you can hang your pots and pans to save storage space and create an attractive display too! The lids are made from shatter-resistant tempered glass and fit snugly to capture moisture and lock in flavor, whilst allowing you to monitor your food cooking without lifting the lid and allowing precious heat to escape. The lid knobs are copper plated, adding to the beauty and practicality of the cookware. These pots and pans cannot be used on induction stove tops. This high-quality cookware set is crafted from durable polished stainless steel. Each pan has an engraved capacity marking. The handles are thoughtfully designed to be extra-long for ease of use across the largest of stove tops and are riveted for strength and safety. Easy-grip loop handles are incorporated into the larger pieces and on the lids for better stability. The lids are made from shatter-resistant tempered glass and are designed to fit snugly to keep-in heat and moisture, so that your food cooks thoroughly and quickly, while retaining flavor and nutritional value. The manufacturer notes that overheating the pans can cause staining, as will food film if it is not promptly removed. Also, if your water supply contains a high iron content, the cookware may appear rusty in time. It’s recommended that you bring liquids to the boil, before you add salt to the food. This will help to prevent pitting that, although not detrimental to the cookware’s performance, will detract from the appearance of the pans’ interior. This cookware set is made from hard-anodized aluminum with impact-bonded stainless steel bases that are suitable for use on all stove tops, including induction. The items are elegantly designed with tulip shaping and a rich, chocolate-colored exterior. This cookware set gives you both strength and durability, and a classy look too! The pots and pans are lined with a PFOA-free non-stick coating on raised circles to allow for superb cooking release and easy cleanup. The raised circle detail also helps to guard against accidental damage or scratching to the pans’ non-stick coating. The cookware can be safely used in the oven up to a temperature of 4000F. All the items in the cookware set can safely be put in your dishwasher. The cookware has sleek, rubberized stainless steel handles for comfortable and secure grip. The lids are made from shatter-resistant glass with extra-wide stainless steel rims, giving a firm seal to keep heat and moisture in while your food cooks. In the unlikely event that you experience problems with this product, Circulon offer a lifetime, hassle-free guarantee. The main selling point of this cookware set from GreenLife is that it contains no toxic substances whatsoever. The non-stick coating is made from Thermolon, which is totally toxin-free at any temperature. 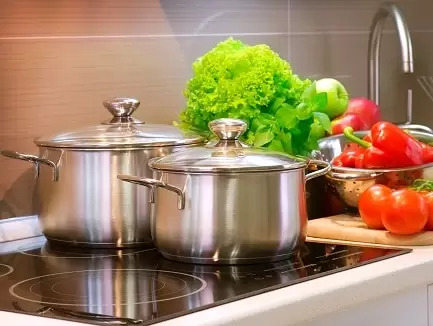 The coating contains no PFOA, PFAS, Cadmium, or lead, guaranteeing that no toxic fumes are released into your home or into the food you’re cooking, even if you accidentally overheat the pots or pans. As an added bonus, the cookware is also easy to clean, thanks to the superior non-stick qualities of the coating. The pots and pans are made from durable, reinforced aluminum, giving a durable, sturdy base that guarantees good heat resistance and quick, even heat distribution for even cooking. All the pouring rims in the set are designed to be drip-free, saving you the hassle of cleaning up spills. The pans have a cream interior so that you can monitor your cooking more easily. Cleverly designed stay-cool, soft-touch handles are comfortable and cool to grip during use. They also have a handy cut-out feature for space-saving hanging and ease of storage. The matching shatter-resistant glass lids are tight-fitting to seal in nutrients and moisture for healthy, flavorful results every time. GreenLife’s healthy cookware is suitable for use on stove tops, including electric, gas, ceramic, and halogen. Unfortunately, you can’t use this cookware on induction stove tops. You can use the pots and pans in the oven up to 3500F. For added ease of cleaning, the cookware can be safely placed in your dishwasher. To help your pots and pans last longer, it’s recommended that you cook on medium to low settings only, and use a few drops of butter or high-smoke point oil. You should also use wooden or nylon utensils only, to avoid causing damage to the non-stick coating. All the pots and pans have a non-stick interior for easy cleaning. 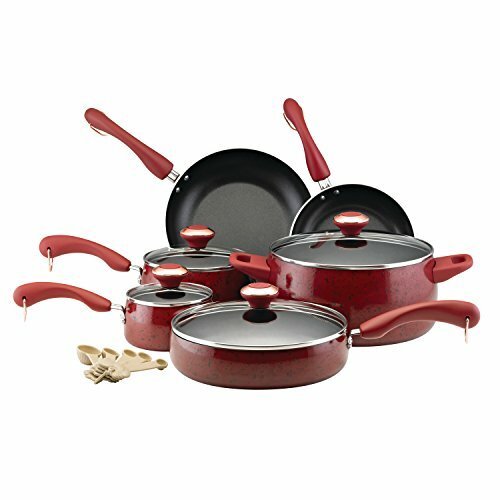 The material used for this cookware set is non-toxic, food grade aluminum, making the items sturdy and durable. The exterior of the cookware is finished in black enamel. The lids are made from tempered glass and feature handy vents that allow excess steam to escape so that the pan doesn’t boil over. You can safely view your food as it cooks, without having to lift the lid, letting heat escape or risking splatter mess all over your stove top. The pots and pans can be safely used in the oven up to a temperature of 4800F. Note that you cannot place the glass lids in the oven. All the cooking utensils are made from heat-resistant, BPA-free black nylon that won’t scratch the inside of the pots and pans. The handles are ergonomically designed and have a hanging storage handle for ease of organization and space saving. The cookware can be used with electric or gas stove tops, but it is not suitable for use with induction cooktops. The non-stick coating makes the items easy to clean, but they can’t be placed in the dishwasher. This premium stainless steel cookware set from high-quality makers, Cuisinart is created with PowerBond high-impact bonded bases, to ensure that the pots and pans heat up quickly and distribute heat evenly. The rims are cleverly tapered to prevent drips while pouring. The riveted handles are made from cast stainless steel, which stays cool even when the pans are hot, so that you don’t burn your hands, and are contoured for a comfortable, secure grip. The tight-fit lids are made from stainless steel to keep in flavor, moisture, and nutrients for healthier, juicier food. You can safely use these pots and pans in the oven and broiler at temperatures up to 5000F without the risk of damage. Although it’s unlikely that you’ll need to call on it, as this is a top-quality product, Cuisinart offer a lifetime warranty. 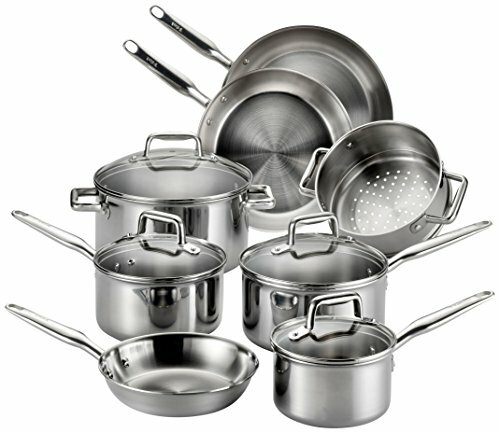 Q: What size cookware set should I choose? A: The size of cookware set that will suit you best depends entirely what you’re intending on using it for and how often you will be using it. If you cook every day and make a wide range of different meals, it may suit you best to choose a large cookware set with a wide variety of pieces. Conversely, if you’re an infrequent cook, maybe go for a simpler basic set with just a few pots and pans. Q: What’s the best material for pots and pans? A: The most suitable material for your cookware set depends on what you will be using your pots and pans for and on how much time you have at your disposal for maintaining them. For ease-of-use, non-stick cookware is extremely popular, but it does take more maintenance than plain stainless steel or aluminum. Remember too that different metals conduct heat at different rates, and this can have an impact on your cooking. Q: What kind of stove can I use my pots and pans on? 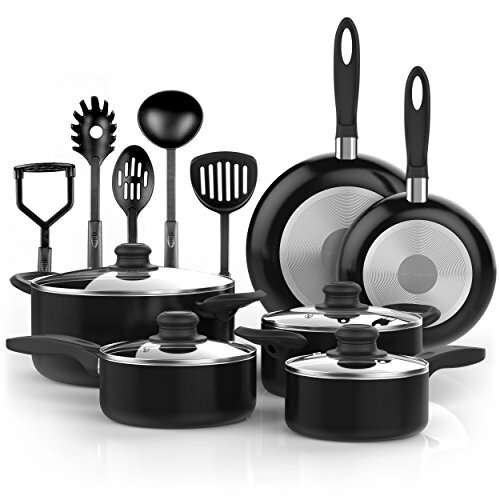 A: All our top rated cookware sets will be supplied with manufacturer’s instructions on how to use and maintain them. These guidelines will include information on their suitability for use on different stove tops. Pretty much every cookware set can be used on electric and gas stove tops, and you can also use some of them inside the oven. However, some products are not suitable for use on induction stove tops. It is therefore important that you read the product features fully, before you make a purchase. Q: Will my new cookware set affect how I cook? A: It may, depending on the material your new pots and pans are made from. The different conductivity rates of certain metals will mean that your food may cook more quickly or slowly than you’re used to. It may take a little time to get used to your new cookware set; practice makes perfect! Q: How can I make my new cookware set last longer? A: The most effective way of extending the life of your new pots and pans is to look after them properly! Be sure to carefully follow the manufacturer’s directions on cleaning and seasoning the cookware, and never place items in a dishwasher, unless it’s safe to do so. Choosing the best pots and pans is a personal decision. However, if you bear in mind the points covered in our guide to the best cookware sets, you’ll find it easy to choose a set of pots and pans to suit your needs. If you’re still not sure which is the best set of pots and pans to go for, check out the FAQ section below for more help and inspiration!